Glaucoma is an eye condition that is often characterized by an abnormally high intraocular pressure (i.e., pressure in the eye), which can ultimately damage the optic nerve. The added intraocular pressure is the result of fluid accumulation in the eye. If left untreated, it can result in complete vision loss. Glaucoma may not produce any noticeable changes in your vision until the disease is more advanced. That’s why having regular eye exams starting at age 40 — or earlier for certain ethnic groups — is an important part of preventing loss of vision from glaucoma. Currently, there is no cure for glaucoma. In addition, any damage to the optic nerve cannot be reversed. Once glaucoma has been diagnosed, though, several treatments including medicated eye drops and surgery are available. Treatments may slow the damage and prevent further loss of vision. Laser surgery (laser trabeculoplasty). This approach is performed to open drainage canals in the eye that are clogged. Filtering surgery (trabeculectomy). With this surgical technique, a small piece of tissue is removed to allow fluid to drain properly from the eye. Placement of a drainage implant, such as iStent. With this treatment option, your ophthalmologist inserts a small tube into the eye that allows excess fluid to drain. 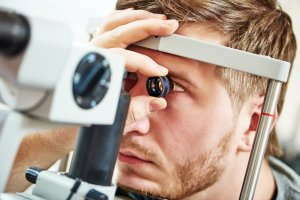 If you notice any changes in your vision, contact us for an appointment, so we can diagnose your vision problem and provide suitable treatment options. If your vision suddenly becomes blurry and is accompanied by severe eye pain, nausea, headache, reddening of the eye or halos, contact your eye doctor or go to the emergency room immediately, as this may be a sign of vision-threatening acute angle-closer glaucoma.